← It’s time for a name. 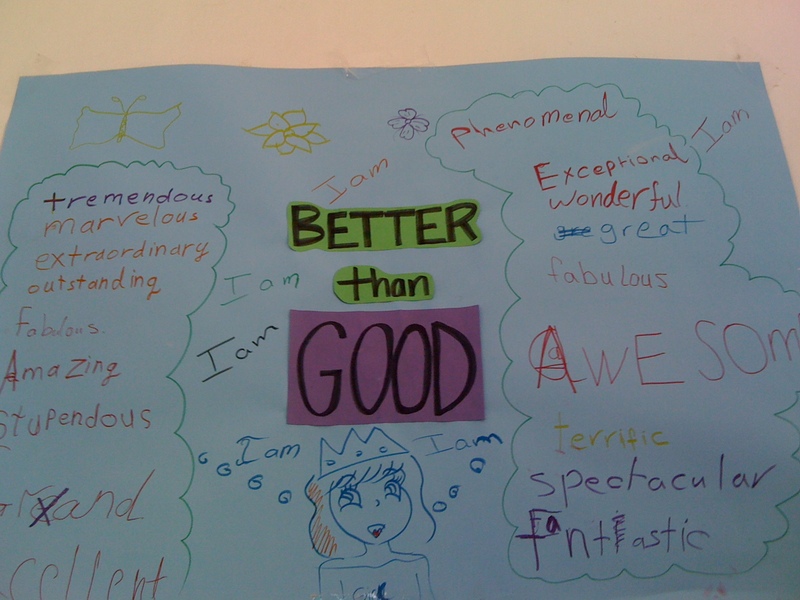 The poster on Ms. Amy’s classroom wall read “Better than good”. Crafted by students as a class project, the girls were given words such as ‘Phenomenal’ and ‘Fabulous’ to use instead of the mundane ‘Good’ which is almost as over used as ‘Fine’ , the nationwide taught response to ‘how are you?’ In an empowering moment the girls had, on their own accord, included ‘I am’ all over the poster. Yet, convincing the individual girls here that they are better than good, has proved to be more of a challenge than the poster’s creation would imply. We had planned a field trip to what is within Nablus debated, but internationally recognized, as the best Kanafeh shop in town. After seeing how the kanafeh was made, we pulled our students into the small hole in the wall to engage in what had become an at least weekly tradition with Amy and I, tasting and evaluating (aka just eating) this Nabulsi tradition. “Yes, but it’s OK because you are older.” Ouch. What seems to have become a universal demand on women to be stick thin and deny their appetites for, in this case, this delicate, cheesy, sweet weighs down on both our shoulders. Is it any surprise? As USian movies and TV shoes are mailed, downloaded, and illegally burned across the world, our anorexic, airbrushed actresses are becoming the envy of the young girls here, and while they will never be blonde, have blue eyes, or a seductive American accent, at least they can strive for skinny. Skinny is something anyone can be, and no one can be enough. Handmade Mother’s Day Cards in hand, the exuberant girls were being herded to the front for a picture. As most girls anxiously awaited the camera’s flash, molding their practiced smiles for the camera, Tala held back. “Why?” I asked Surely it wasn’t for religious reasons as Tala’s older sister was already posing with her card. Not beautiful. By the age of 11, not only had Tala developed and accepted a definition of beauty, but had confirmed that it was not her. I looked at her wildly curly hair and large eyes. Her features are bold and defining. To her, all the positive traits I could mention would not convince her that she was worthy of the term beautiful. Before hitting puberty, she was convinced that her appearance was sub par. It is unfortunate that these girls are struggling to adhere to an impossible image. That after only 11 years, she could look in the mirror and find faults. Technology has entered us into an international age. The words of this blog are no longer limited to my diary as they may have been in the past, or even a local newspaper. As I press post these words are instantly sent throughout the world. Similarly, the movies that the Hollywood industry creates are no longer simply destroying the body image of the blonde hair and blue eyed population from which the actors and actresses were selected, but also that of the gorgeous young women in our classrooms who are, to me, way better than good. This entry was posted in Both Sides of the River, Nablus, Palestine, Uncategorized and tagged Beauty, Better than Good, kanafeh, nablus, palestine, west bank. Bookmark the permalink. Love this story and thanks for acknowledging Miss Amy!